To make up for my recent lack of posting -- and to celebrate Bitterblue being named a New York Times Book Review Notable Children's Book of 2012 -- this post will be about something :). Disclaimer: All the photos in this post are of my own work and are owned by me. If you use them for any purpose, please identify them and attribute them to me. Do not change them in any way or use them commercially. What follows is essentially my tour presentation for Bitterblue... it is the story of how the book was written. Here goes. As you probably know if you've spent much time on my blog, I write by hand. Click any photo in this post to ginormify. Reminder: click to make it BIG. Once I've written 40 or 50 pages -- or, essentially, get to a point where I'm starting to worry about the house burning down (though I do keep my notebook in a fireproof, waterproof safe) -- I transcribe my handwriting into my Word document using voice recognition software (because I can't type much at all without pain). The transcription, like every other moment when I'm looking at my work, is an opportunity for crossing more things out (symbolically) and changing things. That's my essential process for every book. But, of course, there's more to it. For example, while I write, I scribble cheery, encouraging notes to myself. These notes are not born of modesty or low self-esteem. 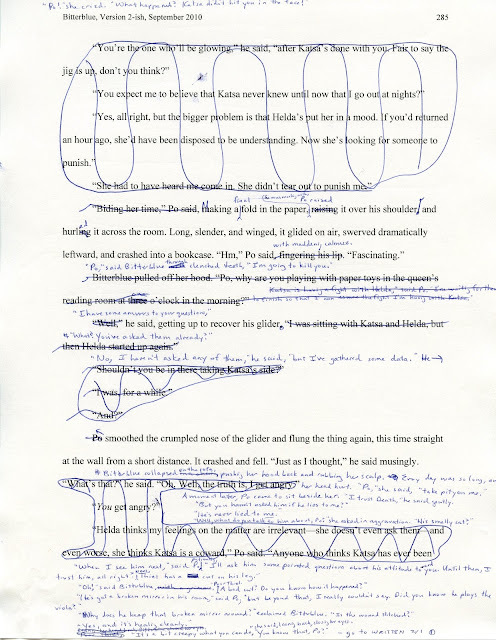 They are born of the simple truth that a first draft is crap; a first draft is terrible, horrible, no good, very bad; and the writer, moving forward while leaving a stream of detritus in her wake, CAN GET VERY DISCOURAGED. But she keeps moving, because, as Robert Frost said, "The best way out is always through." Sometimes, I'm just trying to keep myself from panicking. Notice the date. It's April 3, 2010. I've been writing for two and half years. I'm nowhere near the end of the first draft, which is an insufferable mess. I AM FREAKING OUT and trying very hard not to. 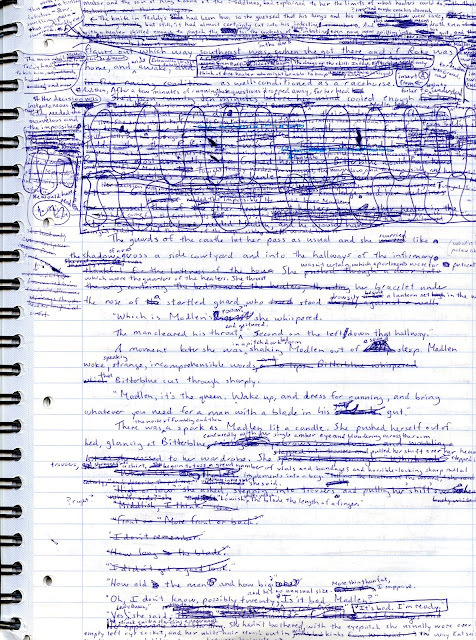 Bitterblue's first draft went on like that for seven notebooks. 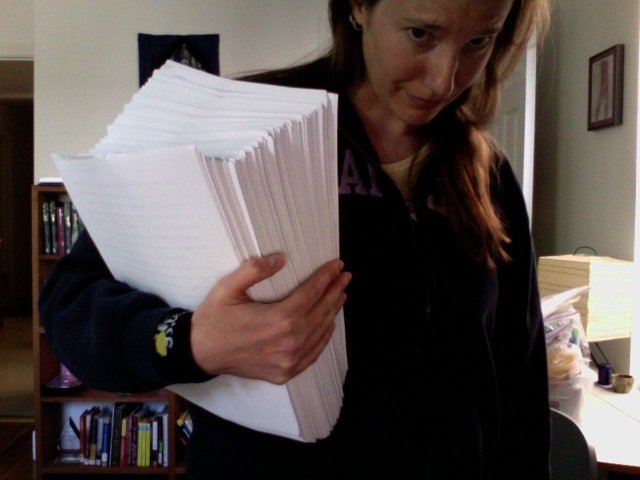 When I finally finished the first draft, three years after I'd begun, it was 800 pages long and weighed 7000 pounds. I sent it to my patient, PATIENT editor. She worked her way through it, poor dear, then sent me one of her typical, long, detailed editorial letters. Here's what's working, she said; here's what isn't; here's what I see you trying to do. Then she said something miraculous. I'm paraphrasing, but what she said was along the lines of: This is going to sound like a crazy idea, but now, at the beginning of the revision process, is the time to voice crazy ideas. Would you consider starting again from scratch? Here's the reason this ended up being the best thing my editor could have said. Within that 800-page mess, the final story was all there. 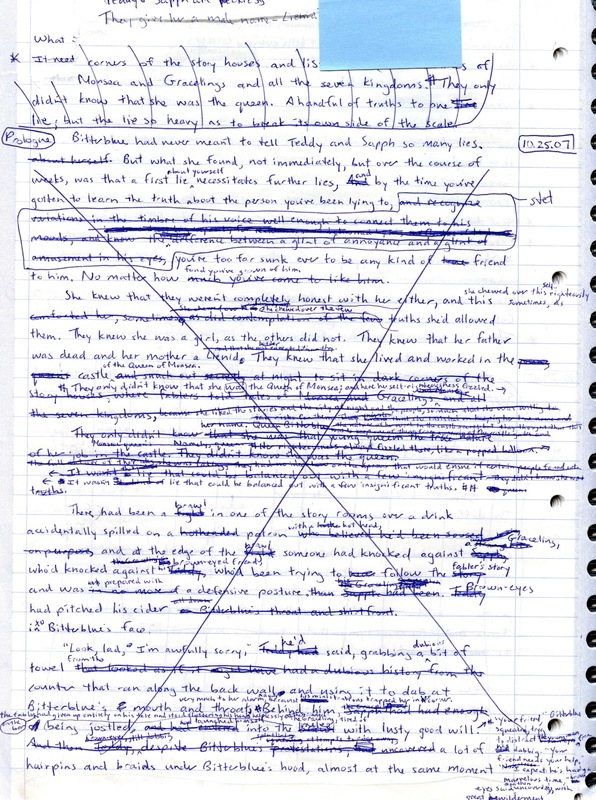 If you were to read Bitterblue's first draft, you would come away with essentially the same story a person reading the final book comes away with. 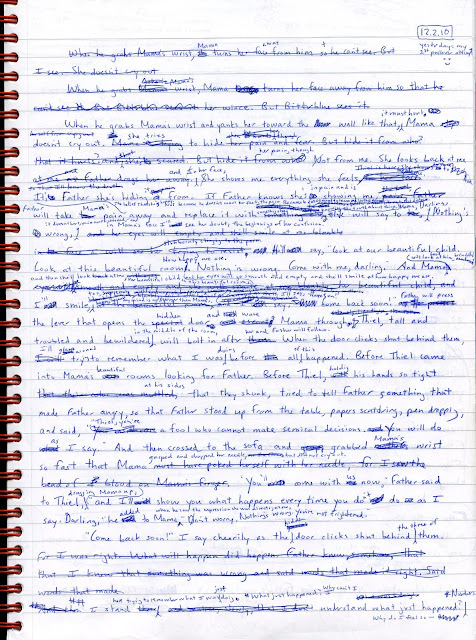 But there was a lot of extra, unnecessary stuff in there, too; I'd spent a lot of space working things out for myself that didn't really need to be worked out for the reader. There were extra characters who could be consolidated into fewer people to simplify things. There were plot complications that didn't need to be so complicated. The themes were buried in crap; they weren't shining. There was an earthquake! (Literally. One plot point was an earthquake.) The story I was trying to tell didn't need an earthquake. Now, normally when revising, I sit down with the printout of the draft I have and start crossing things out, working with what I've got, molding, trying to change the shape of an existing thing into something new. But here was my editor suggesting I start again from scratch. 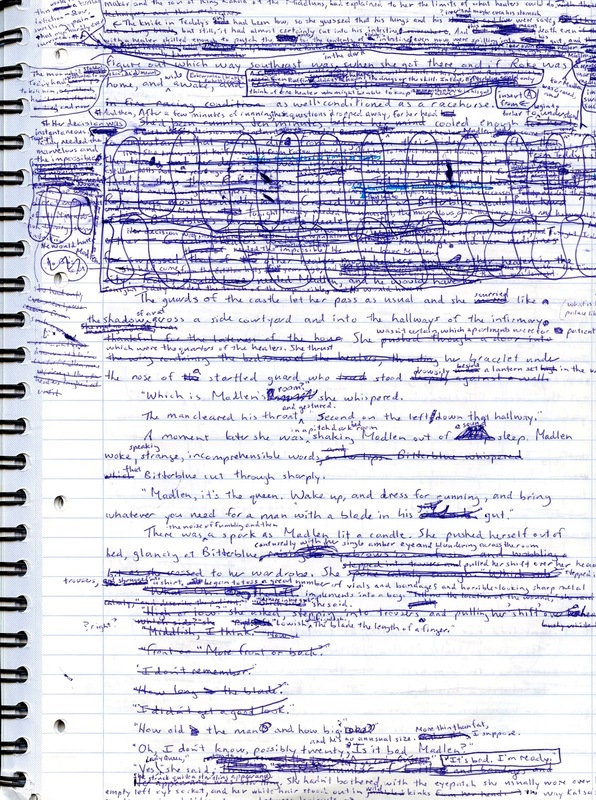 I put the draft to the side, where I could reach it, but where it wasn't right in front of me. I pulled a blank sheet of paper toward me. And I played what was essentially a mental trick on myself: instead of determining to decide what to get rid of, what to change the shape of, what to mold, I said to myself, "I'm writing a book. La la la, here I am, writing a brand new book. Hmm. What, from this pile to my side, might I add?" 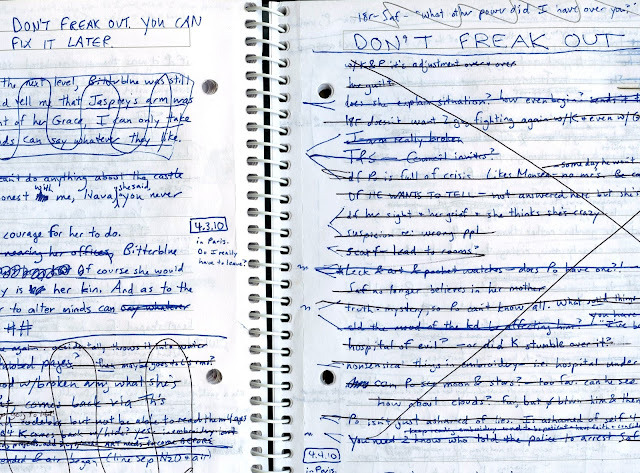 It was an amazing mental freedom; it allowed for a freshness in my second draft, and a freedom from the swamp of my first draft. I was able to write a second draft while NOT stuck inside that first-draft swamp. I was able to tell the same story all over again, and this time tell it so much better. Thank you, stellar editor Kathy Dawson. You saved my book. Here's the first page of the second draft of Bitterblue. 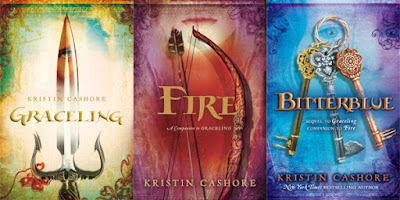 The date is December 2, 2010 -- more than three years since I'd started writing. Can you read what it says? It is almost word for word the way the final version of Bitterblue opens. I feel like this is an important point: it wasn't until I'd spent three years writing a mess of a draft that I figured out how Bitterblue needed to begin. 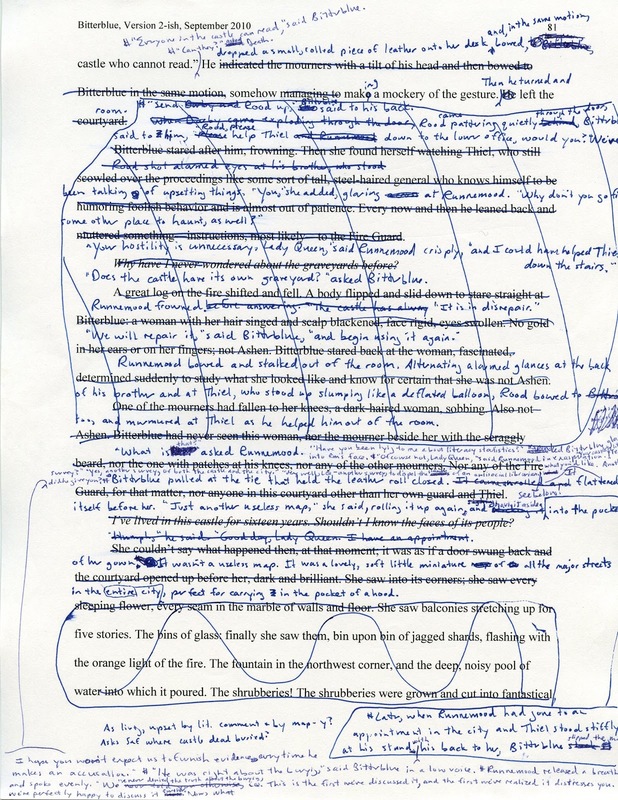 Most days during this revision, it was too depressing to acknowledge I was writing a whole new book, so I would take the printout of the old draft, cross out all the lines, and write the new book in the spaces in between. I just couldn't bear the thought of filling up seven more notebooks; writing on the old printout made me feel like I was revising rather than rewriting, which was comforting. Another mental trick (that somehow contradicted the first mental trick, I know... brains are complicated ^_^). 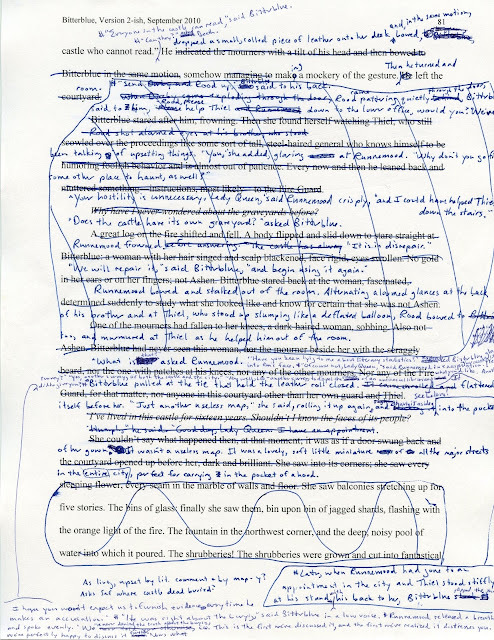 In the page shown below, I've crossed out the old scene (which was related to that earthquake), written a new scene that has no connection whatsoever to the old scene, then crossed out most of the new stuff, too. Sigh. And lest you think it was worse than it actually was!, there were, in fact, pages where some of what I'd written before made it into the next draft :). 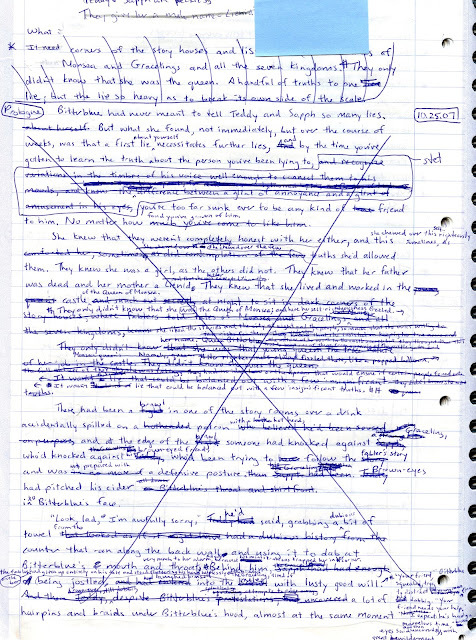 This second draft of Bitterblue took me about five months, if I recall correctly. Five and a half? Easily the longest revision of my life so far. And what happened after I finished Draft 2? My editor continued to send me amazing, helpful letters; friends read and gave feedback; and I revised it several more times. 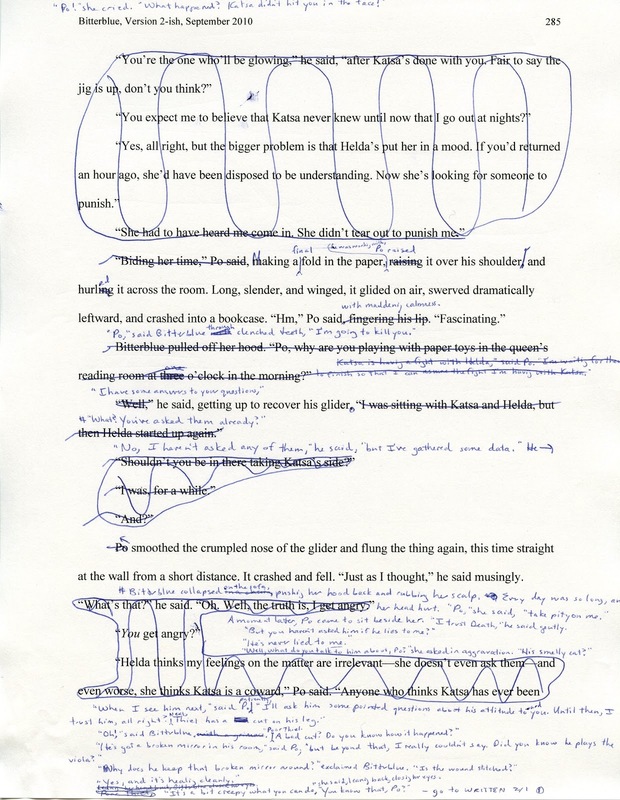 Drafts 1, 2, 3, 4, and 5, and the copyedit and typeset manuscript. 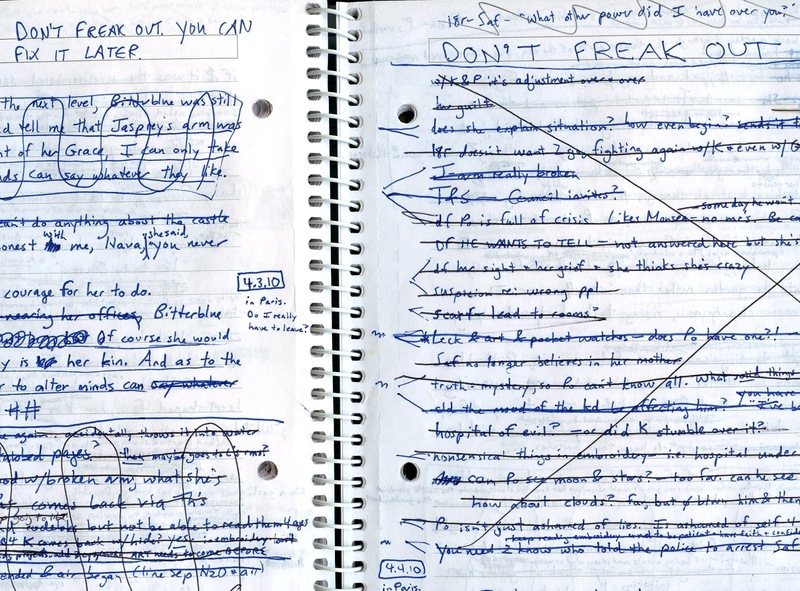 In total, Bitterblue was four years of drafting and revising from start to finish. There's a reason I like to tell this story. It's not because I enjoy making my audience gasp in horror (though I do). It's because I know there are always writers in the audience. I know there are people in the audience who are writing and who feel hopeless and discouraged by their own flawed work. I tell this story because I want to get this message across: THAT'S HOW IT FEELS TO BE A WRITER. It doesn't mean your book will never become what you want it to be. It doesn't mean you're not talented; it doesn't mean you're wasting your time; it doesn't mean your book isn't about anything; it doesn't mean you should give up. It only means that you're writing. I think I've said this on the blog before: I imagine my self-doubt/hopelessness/discouragement as this guy who sits next to me in my chair as I'm writing. He's always there. He is a necessary part of the process; he will never go away; so I may as well invite him to sit in a chair beside me. Sometimes I imagine myself giving him a hug, because he's so sad and pathetic; he has nothing nice to say to me, he only knows how to insult and discourage; he is, essentially, fear. Poor, sad little guy. I say to him, "You can sit in my company, you can say whatever it is you need to say. I know you can't help yourself. I know you're so very scared. So: you are welcome here. But," I say to him, "you're not going to stop me from writing today." That's the story of Bitterblue. Love and godspeed to all writers.